Although a person is not required to be athletic in order to learn Taiji, patience, consistent practice, and time commitment are essential for a Taiji learner to truly benefit from this ancient internal martial arts system. 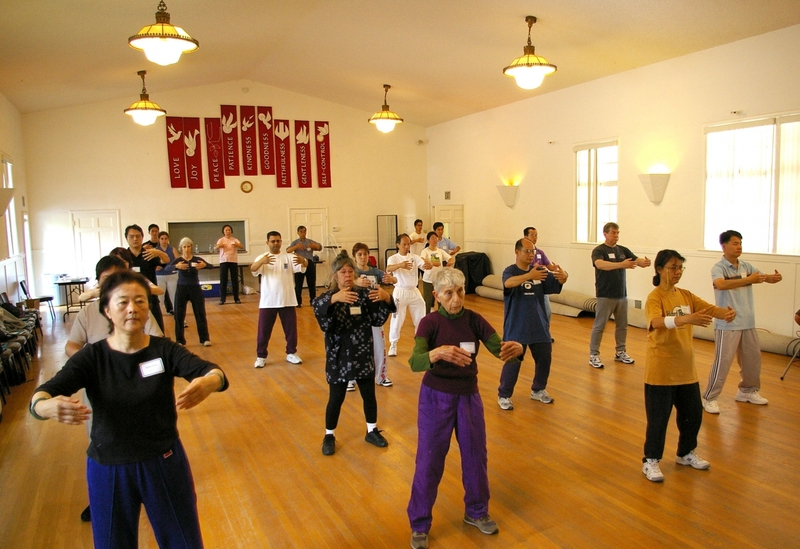 Chen family Taijiquan offers a very complete training system including qigong, empty-hand forms, silk-reeling exercises, push-hand practice, weapon sets, etc. Beginning students usually start with Yi Lu, qigong, and silk-reeling exercises to help them establish a strong foundation and to prepare them if they wish to continue and puesue further the martial aspects of the system. For generations, the practice of Taijiquan has been compromised to the extent that it has lost its original essence. Chen Family Taijiquan, however, has gone through the least amount of change as a martial art and it has not only preserved most of the training methods (e.g. Dan Tian rotation exercises, 5 different types of push-hands patterns, etc) but also some of the most unique training tools (e.g. Taiji bang, Taiji sphere, etc). It is hoped that through the promotion of Traditional Chen Taijiquan, the public will again recognize Taijiquan not only as a health exercise, benefiting both mental and physical health, but also a truly valuable Chinese martial arts system. Each class will begin with the Silk-Reeling Exercises to help students increase the mobility of body joints and relax the muscles and tendons. Wuji Qigong is the core of Taiji qigong and will be taught and practiced for several weeks in class to help students build a strong foundation in qigong theory. Students will be taught a few major accupressure points and how to align these points to improve the students' postures for the promotion of "qi" circulation. It will also assist students in enhancing their focus and improving their immune system by gathering the scattered "qi" (internal energy) back to the dantian. Finally, Wuji Qigong can help students to know themselves better by helping them find their inner center. Once the class understands the premise and has practiced the Wuji Qigong standing mediation, instruction will begin in the Hun Yuan Qigong exercises. The Hun Yuan Qigong exercises can help students reduce mental stress and tension as well as improve concentration and health. Following the Silk-Reeling and Qigong Exercises, the Chen family Taijiquan 1st Form (Lao Jia Yi Lu) also known as Traditional Chen Taji 1st Form will be taught to introduce students to the martial art aspects of Chen Taijiquan. In the private classes, students will learn at their own pace. Private classes are offered for our current students only and at the discretion of the instructor. Our classes are offered at different locations throughout the Bay Area. Please visit here for all class locations and schedule information. style Tai Chi exercises regulate all systems within the body improving digestion, respiration and circulation. As the movements are performed in a relaxed manner this can also lead to a reduction in stress-related discorders. The low-impact nature of the routines improves the condition of bones, joints and muscles without strain whilst encouraging balance, focuses, flexibility and coordination to promote health and vitality within the individual. Chen style Tai Chi has only recently made its appearance on the world scene and is fast becoming the most popular form of Tai Chi in the world today. Both old and young Tai Chi practitioners are beginning to appreciate why generations of the Chen family were determined to maintain their sacred art in its purest form so that everyone may experience the maximum health benefits under their guidance. Chi has become the health exercise to enhance longevity in any age. It is a valuable health exercise. Tai Chi had remarkable success as a curative among health conditions such as neurasthenia, neuralgia, high blood pressure, heart disease, tuberculosis, arthritis, and diabetes due to its deep regulated natural breathing and relaxed frame of mind. With its smooth circular movements contributing to the cleaning of the acupuncture channels and collaterals, Tai Chi has improved the functions of the skeletal, muscular, lymphatic, and digestive systems. The principles of Tai Chi are an embodiment of these essentials for achieving success, but not at the cost of tension or anxiety. With the reduction of stress, the practice of Tai Chi has proven to reduce high blood pressure. In a low bent knee position, Tai Chi has shown to be a cardiovascular stimulating exercise without stress or strain on the joints, muscles, tendons, and ligaments. Through the practice of Tai Chi one can cultivate a strong center, and open mind, and flexibility at the same time. Tai Chi is for health and self-defense. This is an internal martial art, and does not profess brute strength or muscular in its practice. Tai Chi is a very sophisticated and intelligent exercise program. It uses the power of the legs to shift your weight while the arms raise and lower in various full rounded movements. The long held exercise prescription of about 20 to 60 minutes a day, three to five days a week to get positive results proves to intimidating to many persons. You can perform Tai Chi well into your eighties and nineties and receive its life sustaining health care benefits. Could the same be said for jogging, weight lifting, and aerobic dancing? Tai Chi provides a healthy gentle and safe way that totally relaxes the practitioners & teaches us how to use our energy more productively and efficiently. Tai Chi is the great granddaddy of low impact aerobics. Tests have shown us that when the Tai Chi form is done with knees well bent, more oxygen is burned & it becomes an aerobic conditioning exercise. When the Tai Chi form is performed in the low position, great cardiovascular (heart) stimulation occur (between 60-80% of M.H.R.). Tai Chi was found to improve back and neck pain. The twisting of the spine and rotation of the hips act to release stress within the back and allows that area to relax and attain health - it is a self massage that allows the skeleton to fix itself by taking blood to damaged areas - the blood then refreshes the area to help repair damage and open the joints to allow the skeleton to go back into its correct position. The turning of the body in Tai Chi exercises, in conjunction with deep abdominal breathing, "wrings out" the organs, flushing blood out as they're compressed and allowing it to flow back in when the movement compresses another part of the torso. This flexing reduces pockets of stagnation in the various organ systems and invigorates them by rubbing them together and bringing blood to the area.